When they released the beta version of Skype in August 2003, the two founders of Skype, Swedish Niklas Zennström and Danish Janus Friis, did not predict that Skype would become a part of the dictionary. However, they never doubted that they held an exceptionally good idea, which they had to protect in the best possible way. Therefore, they contacted the patent attorneys at Plougmann Vingtoft before the release in 2003 to get help with the patenting of their technology. 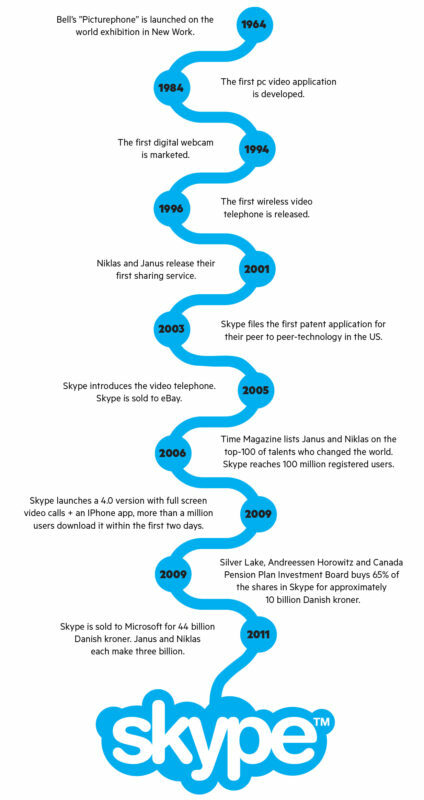 The Skype adventure began to grow in 2000, as Swedish Niklas Zennström and Danish Janus Friis joined forces in order to develop a sharing service based on the peer-to-peer-technology (P2P). The service quickly turned into an international success, and Niklas and Janus had no doubt that there was a great potential hidden in the P2P-technology. They used their experience from the first P2P-based sharing service to develop the now famous telephone service Skype, which makes it possible for users to make free or at least very cheap calls via the internet. In a peer-to-peer-network (P2P), the computer devices are directly connected via the internet. The connection does not go through a central server, as one might know it from client-server-technologies, instead every computer is both the client and the server. This means that the computer makes its services available for other users and makes use of other computers’ resources simultaneously. The advantages of a peer-to-peer-network are many. First, it can handle far more traffic. Second, user safety is higher since you avoid that a central server owned by a private company collects the information, and that the private company can access the calls. Third, the only thing you need is internet access and P2P software. High user safety and encrypted information were big parts of Skype’s DNA the first year. The peer-to-peer-technology meant that they could quickly provide their users with a large capacity, which made communication fast with no delays. Simultaneously, it was new and exciting to be able to talk via the internet, and Skype’s audio quality was better than that of their competitors. These are all reasons why Skype became such a success. Another crucial reason was that Niklas and Janus patented their technology at an early stage. They had a good overview and foresight both in terms of their line of business and patents. Quite often, companies wait too long before applying for a patent and thus risk to be surpassed by competitors. However, the Skype founders’ were very conscious about protecting their technology so that they would not end up losing it to another company. With the help from Plougmann Vingtoft, Janus and Niklas patented the underlying peer-to-peer-technology, first in the US and later in the rest of the world. This comprehensive patenting was a costly affair, but ended up being a decisive investment for the newly started small tech company, because their patents kept other companies away from presenting similar solutions. As soon as the big players in the IT business start addressing new, not-patented technology, the game is on, and it becomes impossible for small companies to keep up. The patenting of Skype was also the foundation for the billion-scale sale to eBay, which made Janus Friis and Niklas Zennström the biggest Nordic IT success story. 2005 was an epoch-making year for Skype. This year they introduced video telephony, which makes it possible to see and talk to other users from all over the world. This is what most of us associate with “Skyping” today, but back then it was a groundbreaking experience. The technology was in strong demand in a globalized world where individuals and companies were moving across national borders. For companies, the technology means that employees can sit on opposite sides of the globe – or just in different cities – and work closely together. They might never have met in person, yet Skype allows them to build a relation. In the educational system, it has become easier to carry out long distance education and knowledge sharing. 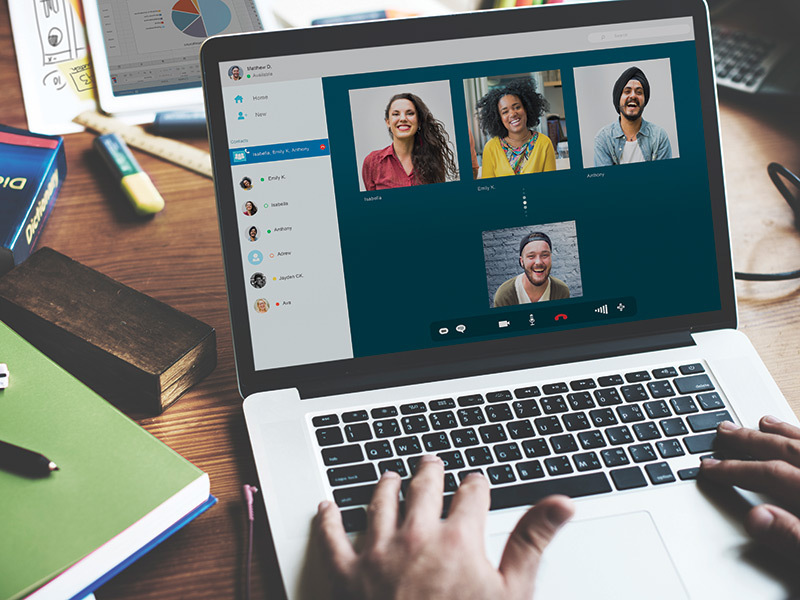 Researchers can skype and cooperate with their colleagues in other universities and in other countries without leaving their desk, and students get easier access to the best teachers without having to travel to another part of the country. Skype is also an important lifeline for the millions of people who are living abroad or in other cities than their family. The technology allows you to take you mother on a virtual tour in your new apartment and lets grandparents wave to your children via the screen. 2005 was also the year when Janus Friis and Niklas Zennström sold Skype to the online auctioneer eBay for approximately 16 billion Danish kroner. They kept the patent of their so-called Global Index Communication Technology under the company name Joltid Ltd. and made a licensing agreement with eBay. Later, Skype assumed ownership of the patent in exchange for 14% of the shares. When Skype in 2011 was sold to Microsoft including patents and the user database, it provided each of the founders with a net profit of around three billion Danish kroner. Overall, an early investment in world scale patents has provided the founders of Skype with billion scale returns twice – first with the sale to eBay and second with the sale to Microsoft. At the same time, the two founders have created a company, which connects people across national borders. This is a success story worth skyping about! … that Skype is short for Sky Peer to Peer. … that Danes already used the verb “skyping” in 2003. … that people around the world daily spend 300 million minutes on conversations via Skype. … that Skype is used to make more than 1.8 billion video calls every year.